Earlier this week I got the amazing opportunity to shadow the ITV News team for the day, learning how it all works: putting the news bulletins together, the graphics involved, the whole nine yards. So as you can imagine, I was pretty excited but terrified in equal measures, as I didn't know what to expect. Turning up at ITN (where ITV News and as I found out Channel 4, Channel 5 and NBC News are also based) I was met by Camilla Mankabady, the News at Ten programme editor, and shown to the newsroom. Here's a fact you might not know: NBC UK News share the same newsroom as ITV, so it was really cool seeing both sides of the room being occupied with different news organisations. The first task on my agenda for the day was to interview Europe Editor James Mates for my podcast (did you know I have a podcast? Subscribe on iTunes and Mixcloud if you would like) and beforehand, I was really nervous and worried about it. But all that worry was for nothing, as he's so lovely and patient, and answered all my questions with lots of detail and knowledge. I'm ever so grateful to James for taking time out of his schedule to take part. Listen to the episode HERE. Interview over, I went to Costa to grab some lunch and upon my return, I was invited to go and observe Paul Brand in the editing suite doing the voiceover and edit for his report going out on that night's News at Ten, all about the revival of the Welsh language being taught in schools. I even helped out a bit, giving verdicts on whether the piece sounded OK and we had a bit of a laugh which was nice and helped eased my nerves a bit more. Camilla then took me to the 5pm meeting for the News at Ten, where I was first introduced to anchor Tom Bradby, which went really well and was really insightful. In between these meetings I got chatting to everyone who was in the newsroom and saw each of their jobs for the day. ITV News have things called 'bongs' (not drug paraphernalia, don't worry) during the headlines of the programme - if you've ever watched any of their programmes, you'll know what I mean. I sat in on the creation of these bongs, making sure they fit to time and look perfect. After our discussion, I was booked in to see how the Evening News was made by sitting in the gallery which is a big room of buttons, switches and screens with the Director and Programme Editor talking in the presenters' ear to let them know what's going on. The presenters always rehearse their script and the headlines to make sure they've got them exactly right. It was so weird to see, as when the report videos are playing on the TV in everyone's homes, the presenters just sat there and waited for their cue to read the next lines. The evening team went home, I went to get some dinner and sat with Tom and the rest of the NAT team, asking him questions and even looking through his headline script to make sure it all made sense or if there was anything to be added. During this time I also went over to the Graphics department and the lovely guys there showed me how different graphics are made, the process of the Royal Family procession family tree being made, the Solar System map (which was really cool) and how they can transmit their graphics from their desk to your TV at home without having to pass through a server or letting anyone else control it. Eventually it was time to go back to the gallery for the News at Ten, which was especially strange as I watch it every night and always wondered how it's made. Much like the evening news, Tom had to rehearse the trail (where he pops up a few minutes before the show), headlines and then his script for during the bulletin. The director Robin and Programme Editor Camilla made contact with the correspondents and made sure they were ready, sorted through the order of interview, in this case Debbie Edwards went first then Robert Moore and the director relays all this back to Tom. How he or any other presenter manages to deliver the news whilst all this is going on in their ear I do not know - that's the craft of television news journalism I guess. Below I've included a video from the Evening News that shows what I mean by being in the gallery and the cacophony of voices. After the News at Ten I got the picture below with Tom before he left and I did the same. I was so sad to be leaving, but I really hope to be back soon. 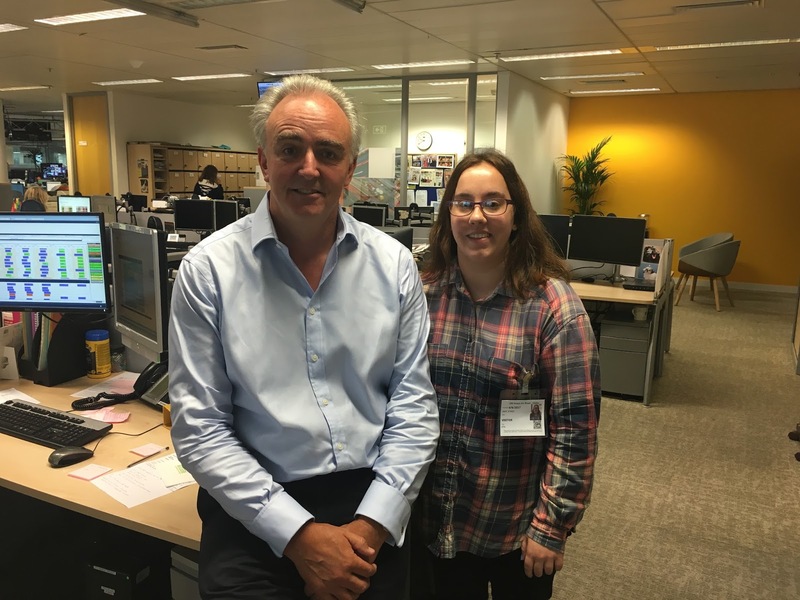 I would like to take this paragraph to say thank you to Camilla, Tom, James and the rest of the ITV News team for being so wonderful and letting me come and check out your workplace for a day. I learnt so much and enjoyed talking to everyone - it was one of the best days and one that I won't forget anytime soon. To follow what's happening in the news, follow ITV News on Twitter, Facebook and Instagram. Also don't forget to check out their bulletins on ITV at 1:30pm, 6:30pm and 10pm every weekday.